GeneaWebinars: DearMYRTLE hangouts have changed! You've heard it right! We're using a new platform to improve our Google hangouts. For months, Cousin Russ and I have wanted to improve access to Mondays with Myrt, WACKY Wednesday and our wildly popular genealogy study group sessions. We love Google hangouts, but for some people there has been the problem of not wanting to join Google+ and deal with a new social media network. We've come up with a brand new look for our video hangouts and it is finally possible for anyone to VIEW and COMMENT using a Facebook, Twitter, LinkedIn or Google account. You'll only need Google if you plan to be a filmstrip panel participant. Cool! Once you've registered using your favorite social media account, DearMYRTLE Hangouts confirmation and reminder emails will give you everything you need to know. 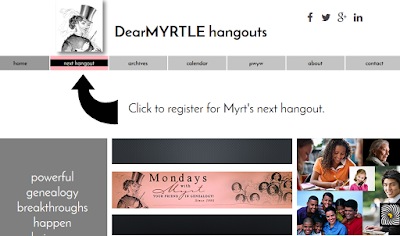 ANNOUNCING: A NEW way to hang out with Myrt posted just now in DearMYRTLE's Genealogy Blog. There's a demo video! Cool!